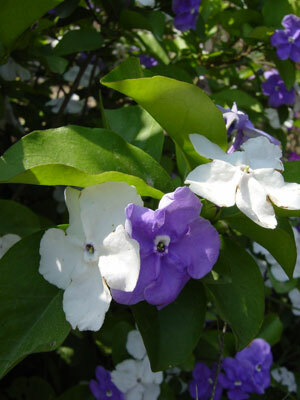 Brunfelsia pauciflora ‘Floribunda’ is an evergreen shrub with green leathery leaves that can reach 5-10 feet in height with a 5-8 foot spread at maturity. Yesterday, Today and Tomorrow gets it’s name from the Pansy-like flowers it bears from Spring to Summer. These flowers open with a blue-violet color and with age fade to lavender and finally white. So on one plant there can be 3 different colored flowers, Fabulous! Just be warned that this plant is poisonous, the berries are very toxic, so look but don’t eat!